Here is the video trailer for our next publication, Movemind, by Robert New. It is available to order now. Christine Hoy will be giving a talk on behalf of the University of the Third Age at 4 pm on 5th April at the Hapimag Hotel, Marbella, Spain. She will be talking about the search for her biological family and her struggle with adoption which form the basis of her memoir, Secret Sibling. She will also be talking about her charity Good News Children’s Trust (UK) for which she works to bring health and education to under-privileged children. The profits from sales of Secret Sibling go directly to this charity. If you can’t make the talk you can still find out more about Christine by reading her memoir which can be purchased through your local bookshop (ISBN: 9780994439925) and online retailers including Amazon. The e-book version is discounted to 99p or 99c from the 4th until the 11th of April 2018. 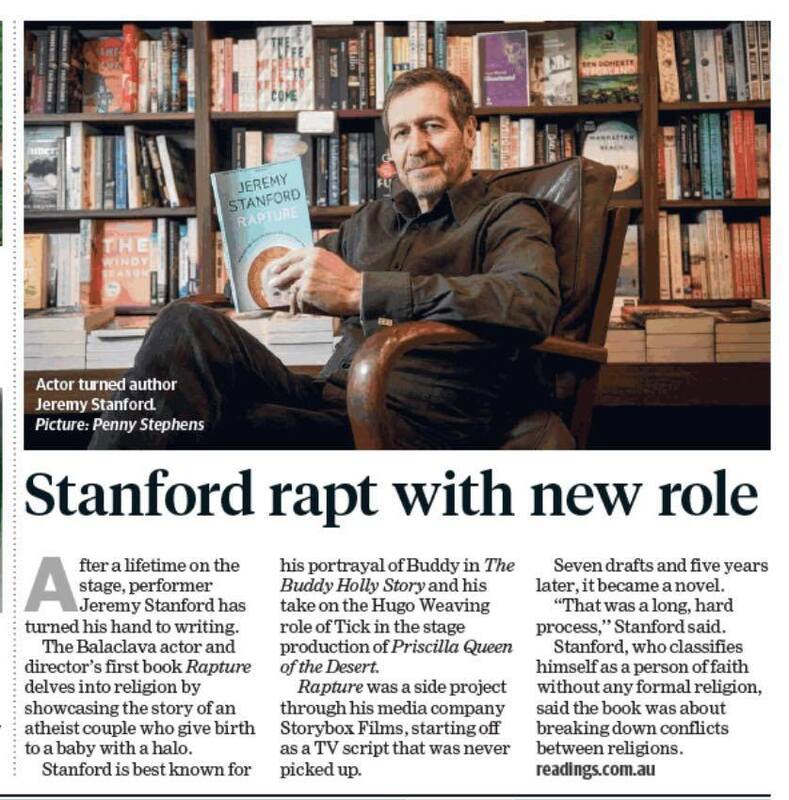 Last Thursday Jeremy Stanford’s debut novel, Rapture, was launched at Readings Bookshop in St Kilda. Rapture tells the tale of an atheist couple who give birth to a child with a halo. 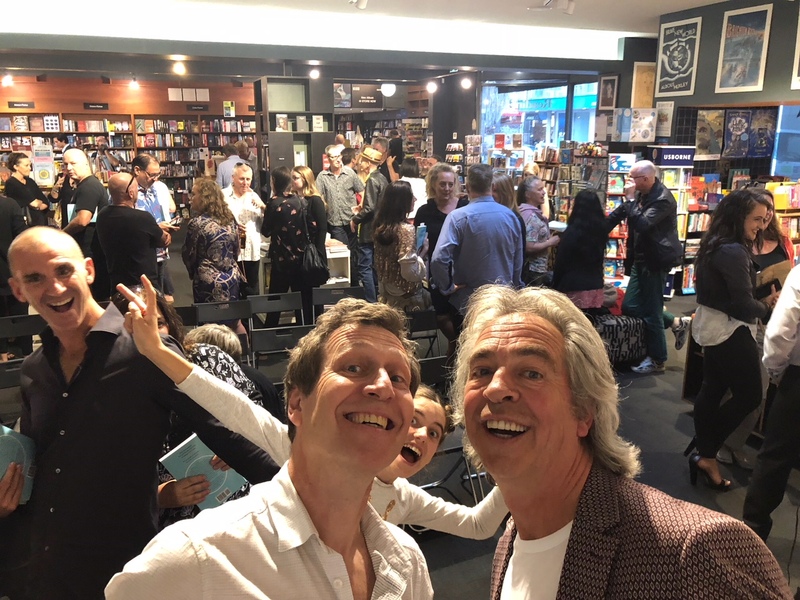 Over 70 people were entertained by the banter of Jeremy and the inimitable Brain Nankervis who hosted the evening. Jeremy spoke about the difficulties he experienced writing the novel and the ideas that were abandoned and added along the way. 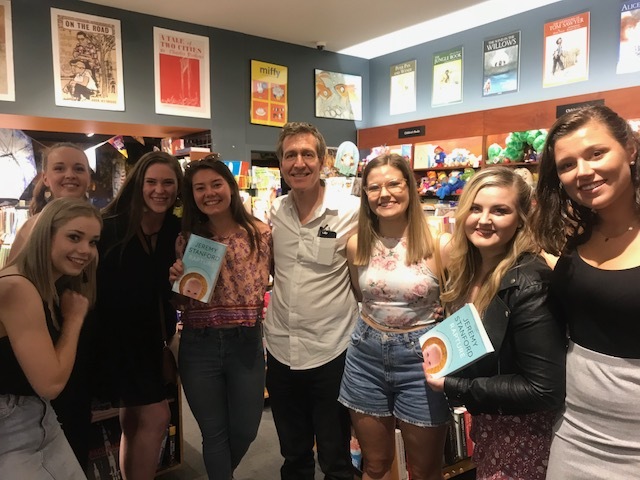 Several guests commented that it was the best book launch they’d been to. Jeremy kindly signed some extra copies for Readings, so if you hurry in you may still be able to pick up an autographed copy. Rapture is available from all Readings stores. The theme of the novel makes it perfect reading for the Easter break, so head in store or order your copy now. 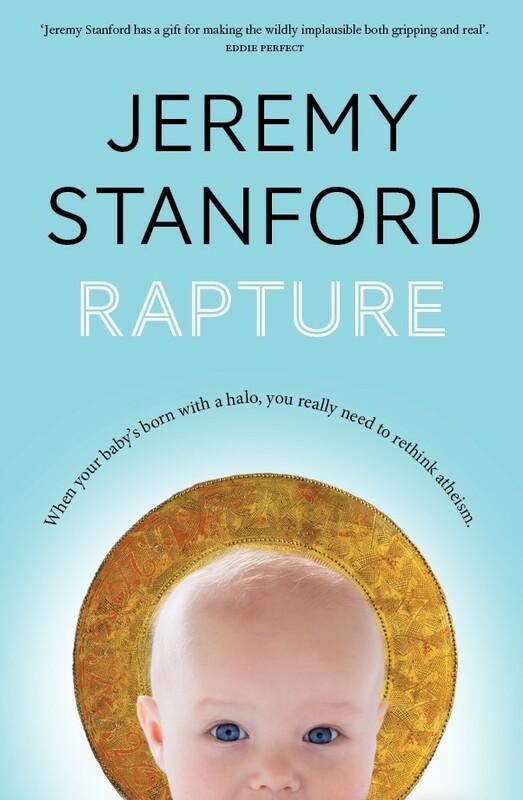 Jeremy Stanford will be launching his debut novel Rapture on Thursday the 1st of March at Readings Bookshop in St Kilda. The event will be hosted by Brian Nankervis. To be one of the first people to get your hands on this book that Eddie Perfect describes as “gripping and real,” be at Readings at 6.30pm. First time parents Tim and Nicole give birth to a baby with a halo. For a couple of atheists, it’s a bit of a shock. In what should be the most auspicious moment of their lives, the couple find themselves scrambling for what to do next. When the child performs his first miracle, they realise they may well have the second coming on their hands. As they go to ground to hatch a plan, their cover is blown, and the church is brought into the frame. But not before the leader of a fanatical religious sect catches wind of their story and vows to have the child for his own. With the church, the fanatical fringe, and even their own family wanting a piece of the new messiah, can Tim and Nicole find a way to bring God to the world without turning the exercise into a circus? In his gripping and darkly comic debut novel, Stanford explores the fight for the ownership of God, and tries to imagine what the world would do if there really were a second coming. The last few months have led to some exciting developments with Tale Publishing. 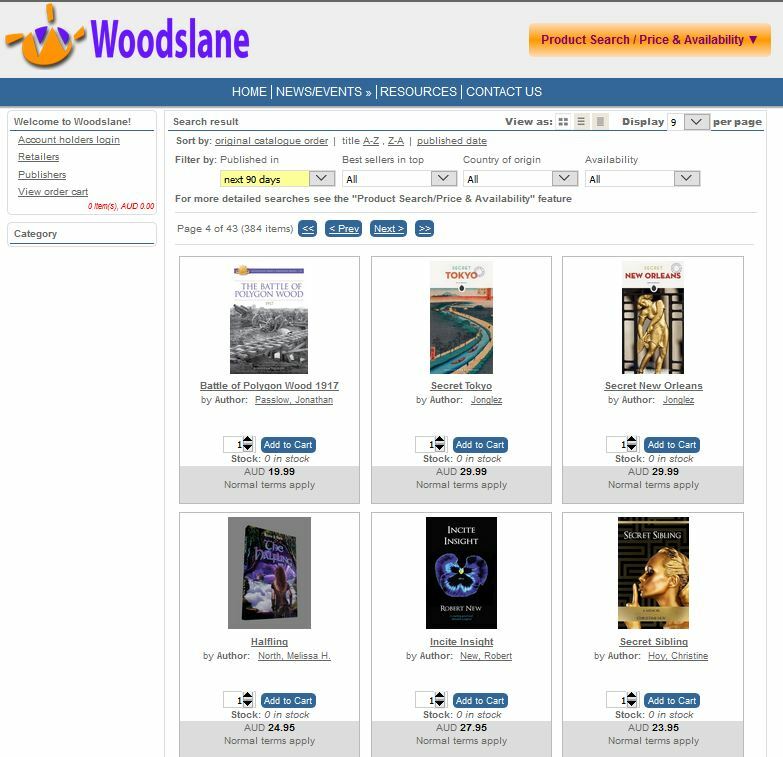 Our distribution partnership has started and orders for hard copies of our titles will now be distributed by Woodslane. Our next goal is to gain similar distribution for Europe. We now have six authors under our banner and several new titles set for publication. In January we will be re-releasing a back title from one of our authors, Jeremy Stanford, called Year of the Queen. This is a memoir of his time in the stage production of Priscilla Queen of the Desert and the release is timed with a revival of this musical. In March, Jeremy’s debut novel, Rapture, will be launched. Early next year will also see the release of a speculative short story collection from Robert New, tentatively called Movemind. This will be his second book with us. We’re also expecting to launch a series of six children’s and two non-fiction books from a new author soon. We’re keeping the rest of the details under wraps as the titles and scope of the project are finalised. Since forming we’ve had strong interest from people submitting manuscripts to us for consideration. We have been thrilled to generate such interest and have signed half of our authors from this process, however the submissions have built up and our response time has extended beyond what we consider to be fair. As such we have made the decision to close our submissions until at least November so that we can clear the backlog.